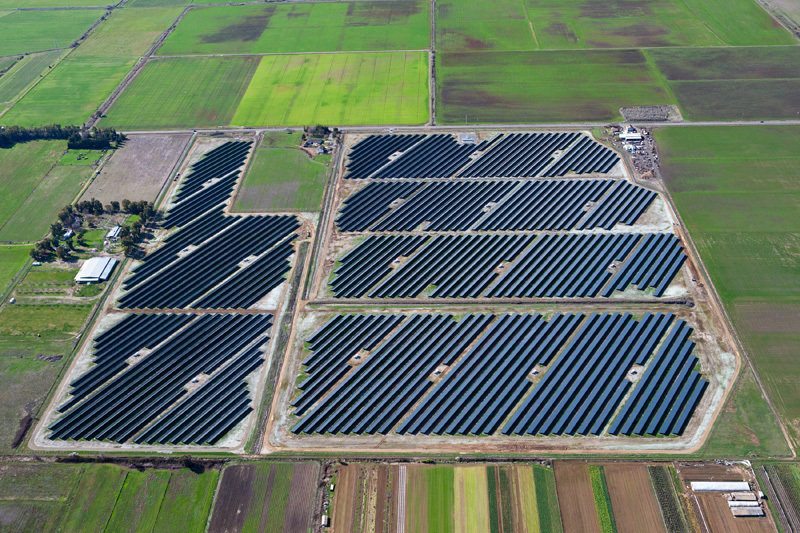 Belectric Inc. was able to beat the clock and complete a four-site, 25 MW solar project for Constellation Energy and California's Sacramento Municipal Utility District (SMUD) within a very short time frame. The four solar plants feature a thin film, fixed tilt system that utilizes 350,000 First Solar photovoltaic panels, enough to power 4,167 homes. The plant is now easily matching, if not exceeding, the expected output, in part due to this year's mild winter and sunny days. They said it couldn't be done, but Belectric Inc., which designs, manufactures, installs, operates, and maintains solar plants throughout the world, was able to design and build four separate northern California projects for Constellation Energy in record time. The four plants totaling 25 MW (one 18-megawatt, two 3-megawatt, and a single 1-megawatt) came as a package deal, says Beth Hoffman, project developer for Belectric. "They are all in unincorporated Sacramento County—two are near the city of Galt, and the other is near Elk Grove." Dave Taggart, president and COO of Belectric North America, says the project came up when talking with a colleague at SMUD (Sacramento Municipal Utility District) who mentioned that the upcoming SMUD Feed-In Tariffs might be a good fit for Belectric. Belectric came to SMUD with a proposal—a thin film, fixed tilt system utilizing 350,000 First Solar photovoltaic panels, enough to power 4,167 homes. SMUD was surprised at the plant, initially thinking the project would require a tracked system. "The system worked because we put our afternoon power peak much later in the day," explains Taggart. "It fit their time of use profile nicely, and we were able to beat the economics of a tracked system." 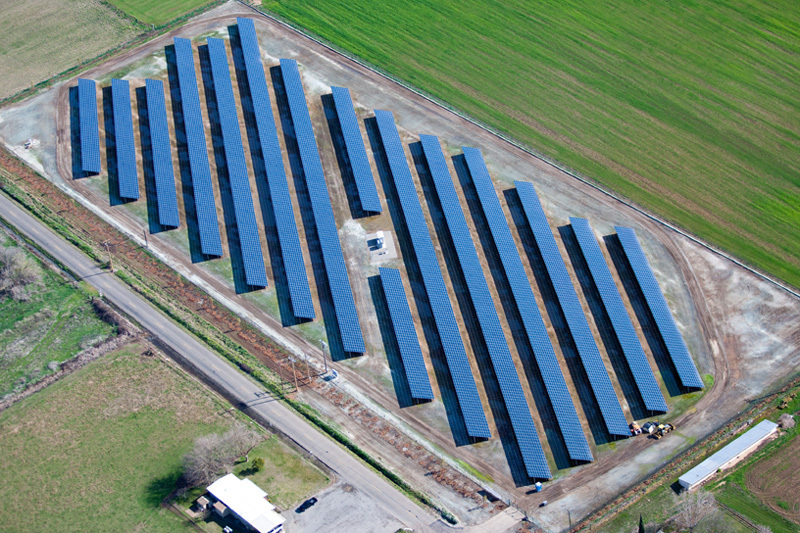 Belectric normally looks for a single site for its solar plants, versus spreading them out. But sometimes the ideal site doesn't present itself, so they chose four smaller sites in close proximity. James Vance, project developer at Belectric, spent countless hours working closely with SMUD, touring the county, and speaking with a myriad of property owners to find the four perfect sites. Typically it's more expensive to design a solar project like this, but due to their close proximity, Belectric was able to design and build plants that were very economical, right down to the 1-megawatt size. "I think most companies wouldn't bother with something that small. Even a 3-megawatt plant is relatively small these days," says Taggart. "In this case, because our system design is so simple and efficient to install, we could hit a site, get through quickly, and get back off the site." When it came to permitting, Belectric couldn't ask for a better partner in Sacramento County. "We went through the entitlement process, including the environmental process, in under six months," says Hoffman, crediting in part the small size of the project. "Each of these sites is fairly close to a good sized city, so the permitting and environmental was a little easier than what you're hearing on these very large plants. "These distributed level projects in the 20 megawatt range, plus or minus, are just a good fit," she added. "People can visualize what 50 acres of solar looks like, or 20 acres.The big projects definitely have their place, but these are just easier to get through the process and for people to accept into their communities." Belectric designed and built the four plants totaling 25 MW (one 18-megawatt, two 3-megawatt, and a single 1-megawatt) for the Sacramento Municipal Utility District project. Belectric is now operating and maintains the sites. Belectric had planned to begin construction early in 2011, but when Constellation got wind of the project and wanted to purchase it, negotiations took a front seat. "We held off on construction, which unfortunately didn't get started until June," explains Taggart. "We weren't planning to do them all at the same time, but effectively that's what we ended up doing." All four sites had to be on the grid by the end of the year. Taggart says the big challenge was logistics. "The materials were the same, but it's moving our custom equipment and manpower around. Getting them all connected to the grid at the same time became a bit challenging for SMUD and the County." "We were asking a lot of our partners—the County and SMUD—to meet this deadline," says Hoffman. "But they responded in heroic fashion and assisted us in meeting our milestone, which was extremely important to the project owners. We couldn't have done it without them." To meet the tight timeline, the County and SMUD had to ensure field inspection as well as final inspections from the County and interconnections from SMUD. "We also had a few line upgrades that were necessary and getting the line crews out close to the holidays was difficult on everyone," says Hoffman. "It's not typical behavior," says Taggart. "We're talking about large amorphous organizations and government bureaucracies. In fact, SMUD is one of the largest customer owned utilities in the country. They understood what we were trying to do and how it all worked, and they really stepped up. It was one of the most satisfying outcomes of these projects—simply the pulling together of all these diverse entities to make something happen." Belectric was able to take advantage of some of the local talent. SMUD reports that the project was able to utilize local surveyors, biologists, landscape architects, module installers, engineering firms, and general construction labor/support, as well as project equipment and material supply vendors, hotels, restaurants, and shops. "All together, I think we had about 100 local employees," says Taggart. Every site used First Solar modules, and the process was pretty much a "copy and paste," except for the AC side, says Taggart. Belectric has an excellent relationship with First Solar. Globally, Belectric has been First Solar's largest single customer. In Europe, Belectric has used First Solar for approximately 90 percent of their projects. "In the U.S., we started our company using First Solar modules, but the U.S. market is so diverse compared to Europe, with so many different customers and so many different geographical and environmental conditions across North America, that we have a broader pallet of systems that we've designed for use here," says Taggart. Belectric also used Satcon inverters at the sites, but the rest of the components on the DC side were all Belectric-designed. Belectric employs around 2,000 worldwide, and 600 of those jobs produce the components, primarily for the European market. Typically it's more expensive to design a solar project with multiple sites, but due to their close proximity, Belectric was able to design and build plants that were very economical, right down to the 1-megawatt size. "Here in the U.S., we contract with vendors to make parts to our specs," says Taggart. "We're a very vertically integrated company. In fact, the only thing we don't do ourselves is develop modules." 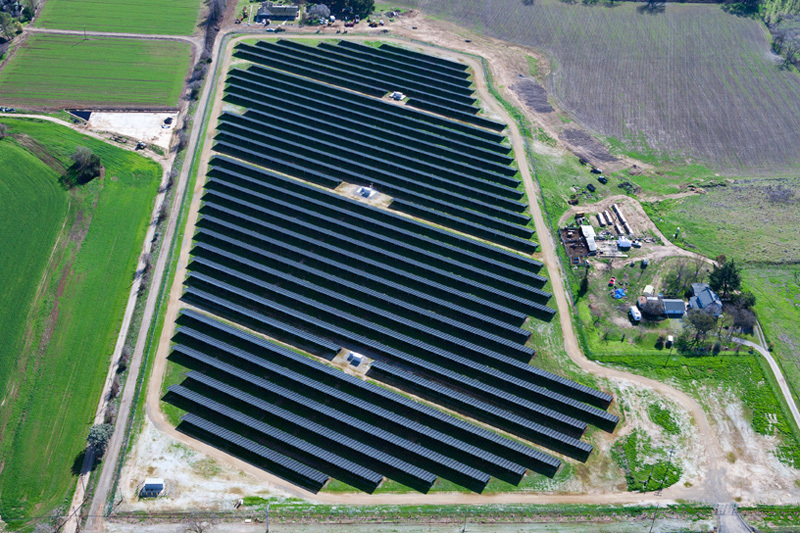 Solar farms often require a good deal of landscaping, and this one was no different. Because it was next to city boundaries in most cases, there was extensive landscaping, including a 20-foot strip of landscaping along the main thoroughfares. "We've also buffered some of the neighbors, and we set aside over 100 acres off-site to offset our environmental footprint," says Hoffman. "This conservation easement that has been set aside extends into perpetuity." Belectric is now operating and maintains the sites. The company has a control center in Newark, California, and they manage all the projects they build in North America. Soon Belectric will merge the two monitoring stations—the one in California as well as the one in Europe. "Germany will monitor their projects and ours during their day time, and we will monitor our projects and their projects during our day time, giving us pretty much 24/7 eyes on all our projects globally," says Taggart. Currently a team consists of 10 monitors. Typically the projects don't require much work, and events Belectric knows about and can foresee are dealt with in a regular planned maintenance type schedule. Once the project went on line, both Belectric and Constellation Energy were pleased. The plant is easily matching, if not exceeding, the expected output, in part due to this year's mild winter and sunny days. For Taggart, another aspect he is most proud of is the aggressive performance guarantee Belectric put together for Constellation. "It's something we worked really hard on. We built upon our experience using First Solar's product and our system design that is unique to Belectric, in terms of the power plant, how it's put together, and the components that we use. Our deep knowledge of PV technology and ability to optimize our plants, combined with our ability to design and execute these projects very quickly, allows us to offer varied performance guarantees to suit market demands." "These projects are also relatively new to this region of California," adds Hoffman. "You hear in the press of some of the larger projects being planned and/or under construction in Southern California, but these utility scale projects in Northern California are a relatively new phenomenon. It was very exciting for the local community." Now that the four-site project is complete, Belectric is preparing to do some outreach to the schools, among other things. Projects like this are helping Belectric grow a presence in the U.S., a solid presence that they already have established in Europe. Last year, the company completed 391 MW, setting a record for the second year in a row as the world's largest PV systems integrator. "It's hard to say this year how we're going to do," says Taggart. "But I imagine we'll easily surpass last year's number." North America only played a small role in the record—approximately 15 percent—but expect that number to grow as well. For the Sacramento project, no one company can take credit. It took tremendous teamwork to make it happen. Taggart and Hoffman said that all parties stayed focused on the end game and did more than they typically do. "In the beginning, we heard a lot of people saying, ‘There's just no way it's going to happen by the end of the year.' But using some of the local professional support in the early stages was key," says Hoffman. "The local professionals knew what the County would be looking for, so we were able to meet that quickly rather than trying to guess and iterate. Our landowners were instrumental in helping make this happen, and many of them continue to farm the remaining portions of their property. It was also welcome income for them in difficult times." "It was definitely a group effort," adds Taggart.